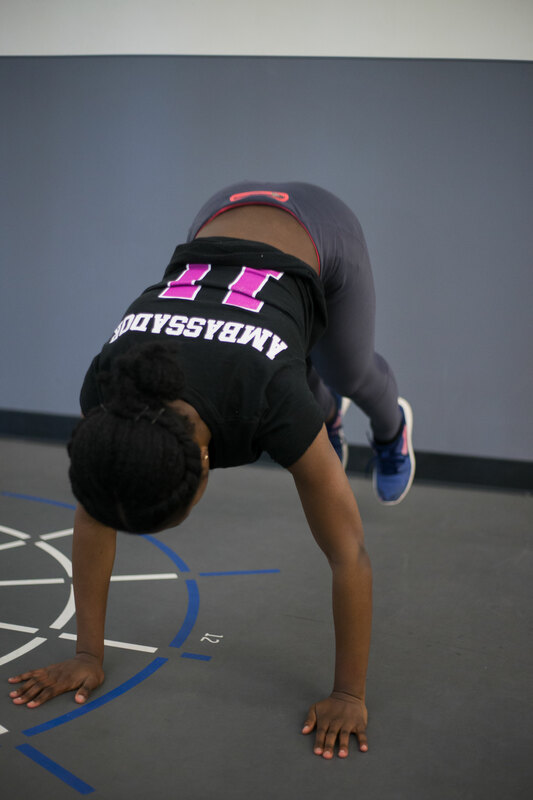 Yaa Takyiwaa, president of Pretty Girls Sweat and a senior double-majoring in integrative neuroscience and comparative literature, shared some of her favorite workouts with PRISM, which are great for fitness enthusiasts and novices alike. Begin with the BOSU in front of you, ball side down. Keeping your core engaged for balance, step on the BOSU by positioning your feet shoulder-width apart. Next, lower into a squat, while keeping your knees and toes pointed forward, to the point where your thighs are parallel to the floor, or deeper for more of a challenge. Once lowered, make sure your kneecaps don’t pass your toes and that your torso leans forward slightly. Hold the squat position for one to two seconds, then rise back up to complete one squat. 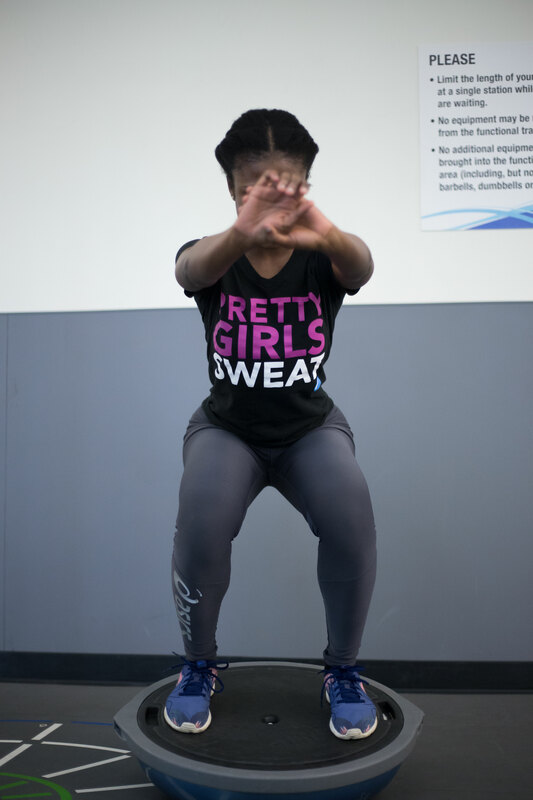 If you feel uncomfortable using the BOSU, simply perform squats on the floor. Perform three sets of 15. Begin with your feet slightly wider than shoulder-width apart. With your weight in your heels, go into a squat position. Next, bend your knees, fold forward from your waist and plant your hands flat on the ground in front of you. Next, step or hop back into a plank, pushing away from the floor and keeping your core engaged. For an added challenge, you can perform a pushup. Step or hop your feet back toward your hands and simply return to a standing position or jump up toward the ceiling, landing in the starting position. Perform three sets, ranging from three to 10 reps in each. Begin by lowering into a squat position without getting as low as you normally would. 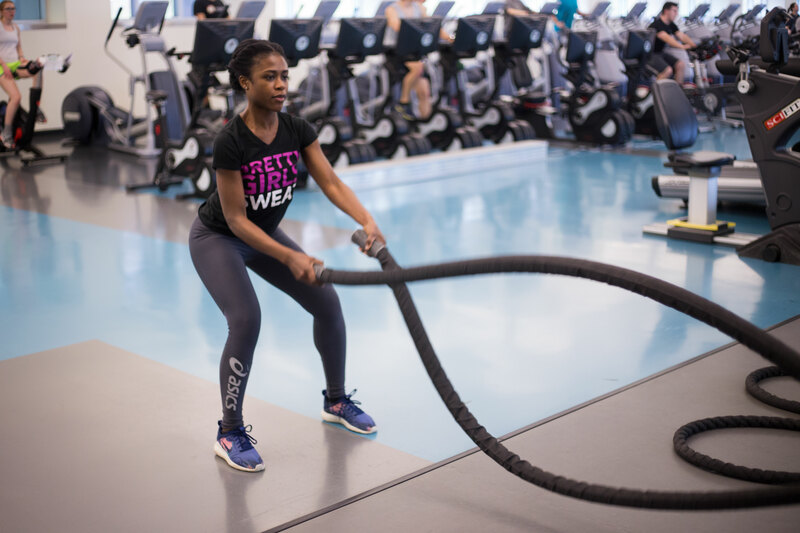 With your weight in your heels, hold the ends of the rope and extend your arms in front of you with your hands shoulder-width apart. Tighten your core and begin alternately raising and lowering each arm explosively. Alternate between work and rest in sets of 15 to 60 seconds.